Rules of Golf: What Is the Procedure for Identifying Your Ball - Rule 12-2? What Is the Procedure for Identifying Your Ball - Rule 12-2? It happened to me again at the weekend, during a match play competition. It also happened last week, and it will probably happen at least once a month in rounds of golf that I play in the future. An opponent’s ball had nestled in grass about three inches deep and when he reached it, he wasn‘t absolutely sure that it was his ball. I was walking to my ball on the other side of the fairway. He bent down and picked it up, checked his identification marks, and replaced it carefully. I am sure that he did not gain any advantage from doing this and I chose to ignore his breach, as I am entitled to in match play. However, if we had been fellow competitors in a stroke play competition the Rules require that I must bring it to his attention that he has incurred a penalty of one stroke for moving his ball at rest, Rule 18-2a(i). So, what is the correct procedure under Rule 12-2 when you want to positively identify your ball in play without incurring a penalty? Before lifting the ball, you must announce your intention to your fellow-competitor in stroke play, or your opponent in match play. You must mark the position of the ball. You may then lift the ball and identify it, provided that you give your fellow-competitor, or opponent, an opportunity to observe the lifting and the subsequent replacement. Note that the ball must not be cleaned beyond the extent necessary for identification when lifted under this Rule. This leads me to one of the best tips that I can give to any golfer who wants to reduce their scores through a better understanding of the Rules. Make sure that you put clear, personalised identification marks on every golf ball that you play. If you always mark your balls in the same way, the likelihood is that you will never make the mistake of playing a wrong ball, which incurs a penalty of two strokes in stroke play and loss of hole in match play. It is not good enough to say that you are playing a Tiltleist Pro V1 2. There could be at least 10 such balls abandoned on any golf course at any one time. And for those of us who play whatever brand of balls we are lucky enough to find, or get given, it can be difficult to remember which ball we are playing if we have already lost half a dozen balls in water or the rough. There is another advantage to putting personalised identification marks on your golf balls. Now and again you may benefit from a benevolent Club member who finds one of your lost balls on the course, recognises who it belonged to, and returns it to you, probably with a lot of derision and banter! Paddy is very particular with the identification marks that he puts on his golf balls. 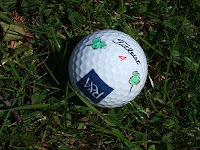 He always purchases Tiltleist Pro V1s with an R&A logo, and then fills in three of the dimples in green with a black stalk, to resemble a shamrock. On a windy day Paddy takes a brand new ball from his bag and slices his tee shot into bushes on the very first hole. After playing a provisional ball he spends 3-4 minutes searching for the original and then gives up and continues play of the hole in a very dark mood. From there his round improves and he is playing well when he strikes a three-wood 220 yards, just off the fairway and into the rough on the thirteenth. As he approaches what he is certain is his ball, a player on another hole walks straight up to it and starts taking his stance. Paddy’s dark mood returns and he shouts at the player, telling him that he is about to play a wrong ball. “No I’m not, this is my ball” is the response. “Not unless you’re playing a new Titleist Pro V1 with an R&A logo, and a green shamrock with a black stalk on it”, Paddy says sarcastically. Why not subscribe (top right of the home page) and receive my new blogs on the Rules as soon as they are written (about once a week)? 1. Two players playing the exact same ball without identification marks tee off. Their balls rest next to each on the fairway. They cannot tell which ball is which. What happens then? 2. Same two players still playing unmarked balls make holes in ones in the same hole. Can they both record their holes in ones? Decision 27/10 rules on the situation in your first question. Since neither player can identify a ball as his ball, both balls are lost and they incur the stroke and distance penalty. In the unlikely circumstances of the your second question, both players have scored a hole-in-one. If only one of the balls had been holed and the other remained on the lip of the hole the ruling would be as in your first question. However, with both balls in the hole the question does not arise as to the ownership of the balls. Decision 15-1/2 confirms. thank you. I hope you do not mind that I refer your site to those who ask me about the rules. i confess to not being as well versed as you and so therefore I steer them your way. I would be grateful if you, and every other reader of my blog, refers the link to others that want/need to improve their understanding of the Rules of Golf. What would you say to your friend who sees a ball and often will lean over and very carefully peak at the ball by gently touching it. The ball moves and supposedly returns to its original position.? There is no penalty when a fellow competitor touches your ball and replaces it at its original spot, however it is poor etiquette for them to do so, unless there has been a request. I would ask the player to permit me to identify my own ball, as the Rules allow. However, be very sure that you know the correct way to do this without incurring a penalty, as set-out in Rule 12-2. Barry, a player is searching for his ball and another player ( opponent in this case ) asks what he's hitting. The player says I think it's a Slazenger 4. The opponent says this is a Slazenger 1. The player says, "That's it." I'm not sure how this plays out. The player knew he hit a Slazenger but wasn't sure what the number was and the ball was found where he thought it'd be and no others were. Obviously, a personalized mark should have been on the ball but it wasn't. Is the ball actually lost or since the responsibility of correctly identifying the ball lies with the player and he's sure that's his ball does the fact he said the wrong information matter? Thanks! The Rules require that a player must be able to identify their ball, not that they have a good memory! In my opinion, Decision 12-2/1 suggests that in the circumstance that you describe the player's identification of their ball would be sufficient, unless there was clear evidence that, because of the ball's condition, it could not be their ball, or another Slazenger ball was found in the same area. Barry, thanks for your interesting blog which should be required reading for all keen golfers. My query is about the type of marks put onto a ball. Like many other people I use a straight line on the ball (plus other dots) to identify the ball. at a recent seminar the coach said we should mark the ball with a full circle around the circumference which we could then use as a putting aid. I always thought a full circle wasn't allowed - am I correct? I recall Ping selling a ball coloured differently on each half you use as a putting aid but this wasn't allowed in competition but things may have moved on. There is no restriction as to the markings that a player may use to identify their golf balls, so a ring around the circumference is permissible; it is a common myth that it is not. However, the description of the manufactured ball that you describe would breach the general requirements for a ball, as set out in Appendix lll 6. to the Rules of Golf.